My name is Stephanie Zonis, and welcome to Organic Matter for July, 2006. Chocolate is a subject near and dear to my heart. It had better be; I’ve been writing about it since 1997. I still love it and still eat it almost every day. In the past decade or so, I’ve watched the number of organic chocolates available in the U.S. increase steadily. Part of that, certainly, is due to the rising popularity of organics, and part is due to the awareness and public approval of the Fair Trade movement (there are very few certified organic chocolates that are not also Fair Trade certified). However, there are naysayers to just about every issue these days; in this instance, I feel that some of their claims are justified. Let’s take a look at the pros and cons of organic chocolate. First, the pros. Cacao plants are subject to a host of parasites, pests, and diseases. These include everything from capsids to mealybugs, rats to pod borers, and vascular-streak dieback to witches broom. By consequence, conventionally-grown cacao plants are subject to a host of treatments with synthetic pesticides and fungicides, not to mention fertilizers, including some that have been banned for years in the U.S. These show up in trace amounts in finished chocolate, but it’s unlikely that you’d consume enough chocolate to make you ill from that. No, the farmers and plantation workers are the ones who become ill from the use of these synthetics, often chronically or seriously or both. Run-off from these chemicals goes into the water and soil of cacao-producing regions, too, potentially contaminating both. 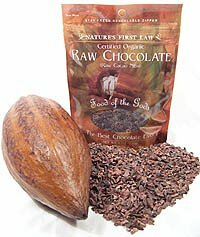 Cacao was once grown exclusively in indigenous varieties, under “shade conditions.” Other, taller trees, called “mother” trees (often banana, plantain, coconut, or rubber trees), provided protection from the fierce sun of the tropical regions in which cacao is grown, while the cacao plants established themselves. (When the cacao plants had settled in, they could tolerate more sun, but still did best in partial shade.) These “mother” trees allowed enough light for the cacao plants to flourish and provided havens to any number of birds, reptiles, rodents, and small mammals. 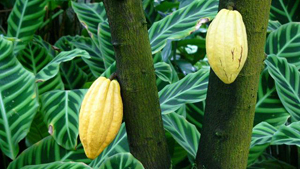 However, partially due to increased demand for chocolate, hybrid cacao varieties have been introduced in recent years. While they provide a superior yield, the cacao they supply is often of lower quality. In addition, these cacao hybrids require either less shade or none at all. With the help of a host of chemicals, some of these cacao plants can be grown in full sun. This means that the “mother” trees, once so necessary to successful cacao growing, can be, and are being, felled for timber. The reduction in these trees means a loss of habitat for species, as well as increased soil erosion, thus threatening biodiversity and long-term suitability of the soil to produce any crops at all. Photo of cacao tree by Sanjay Pindiyath. None of this is anything you haven’t read before, and it all seems clear-cut. What possible objections, then, could anyone have to using organic chocolate? Part of the problem lies in growing and managing cacao farms organically. This is too complex and lengthy an issue to be discussed in its entirety here, but simply getting organic fertilizers, pesticides, and fungicides to many cacao-producing areas would be expensive and difficult. Organic farming can be more labor-intensive and time consuming than conventional farming, and in regions of the world where it takes the resources of entire families simply to keep the proverbial wolf from the door, there may not be sufficient time or labor for more work. Additionally, there is very little incentive to go organic for the large corporations overseeing the growing of tons of cacao annually. Fair Trade cocoa still accounts for only a small percentage of what’s produced worldwide every year. Growing and maintaining an organic cacao plantation would be slightly more work, and somewhat more expensive, than conventional cocoa production. Lacking a substantial worldwide movement among chocolate consumers (and say what you will about Fair Trade, but they’re not at the point yet where they can demand and get substantial changes in cocoa production), these large corporations feel that they don’t have to bother. There’s also the question of organic chocolate’s character. I asked around among some chocolatier friends and acquaintances, and their answers were unvarying. Most organic cacao is grown on very small “plantations,” and production is not overseen by any one body or agency. That results, they say, in inconsistency in the finished chocolate. Even now, when organic chocolate has made great leaps forward in taste, texture, and any of the other aspects with which chocolatiers must concern themselves, I know many a manufacturer who will not even consider using organic chocolate because they say the high quality they demand simply isn’t there or because the organic chocolate they’ve tried to work with varies too much from shipment to shipment. Well, is chocolate quality really that important? We enjoyed these organic cacao nibs even more than some non-organic nibs we purchased. You can click here to buy them. We sprinkle them in salads and soups, as well as for sweet applications. To these small-scale producers, you’d better believe it is. The quality of their chocolate, and their ability to work with it as their starting material, are their best distinguishing points—what separate them from the plethora of large manufacturers in this country (at least), all of whom have better distribution and deeper advertising pockets. These micro-chocolatiers are fiercely passionate about their products, and they have to be in order to survive in the intensely competitive chocolate world. Being as much of an elitist as any of them about the chocolate I consume, I cannot condemn them in their seemingly endless quest for what they feel is chocolate of only the best quality. So what do you do? That depends on what you think best. I don’t have an answer for everyone here. Because chocolate is a luxury in my diet, as I hope it is in yours, I choose to be guided by my taste buds. As a rule, I don’t eat mass-produced chocolate bars or chocolates, so my contribution to a way of managing cropland and lives that I know to be harmful is probably less than that of some other chocolate consumers. When I find a chocolate I really enjoy, if I have a choice, I’ll pick an organic version. I expect this to be less of an internal struggle in coming years, as organically-produced chocolate grows ever better in quality. And if you choose to eat only organic chocolate now, I applaud your resolution. Jeff Shepherd, founder and CCO (Chief Chocolate Officer) of Lillie Belle Farms, is an unusual mix of hippie and connoisseur. A former B&B owner in Hawaii with Belle, his wife (their daughter is Lillie, so you know where the name comes from), Jeff now makes chocolates in Oregon, using only an organic single origin chocolate from Costa Rica. I asked him about organic chocolate, and why he uses it. He told me he believes that “organic is the right way to go,” but emphasized that he’s lucky, since he’s found an organic chocolate that both suits his purposes and meets his high standards. Part of Lillie Belle Farms is a near two-acre “patch” of berry farm, which was recently certified organic. Raspberries, strawberries and marionberries (a cross between Chehalem and Olallieberry blackberries) grow there, waiting to be harvested and turned into some fine preserves or, better yet, into chocolates that consist of these preserves surrounded by a dark chocolate shell. Fabulous! Other must-try offerings include Pistachio/Almond and Cocoa Nib Toffees (click here for THE NIBBLE’s review). 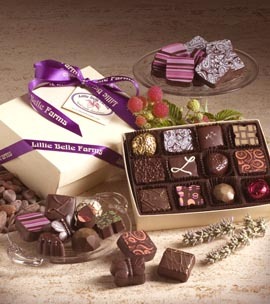 Lillie Belle Farms offers a range of ganache fillings for other chocolates from Orange to Chipotle. Their Lavender Caramels are legendary (also a NIBBLE favorite—click here)! Gift boxes and corporate gifts are a house specialty. Online ordering is available, but only during cooler months; during warm weather, call to ask about shipping. Surf over to see these products at www.lilliebellefarms.com, or call them toll-free at 1.888.899.2022 (9 a.m. to 5 p.m., PST). Check ‘em out!